Elly in Love, quite simply, is everything a wonderful book should be. It has all the elements that a wonderful book needs: love, humor, family, and flowers. Even without knowing all the flowers arranged throughout this novel, I could still appreciate the lush beauty of each description. I found myself wishing again and again for an illustrated edition – or a quality, comprehensive encyclopedia of flowers with plenty of gorgeous, full color photos. 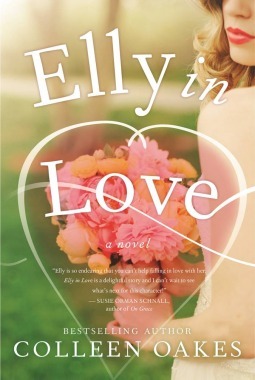 Elly in Love is the sequel to author Colleen Oakes’ Elly in Bloom. It’s a middle book – the second in a planned Elly Jordan trilogy – and my favorite middle book to date. (I generally don’t like middle books in trilogies!) But there is just something mesmerizing about Elly and the way Colleen Oakes write about her heroine. Elly Jordan is far from perfect – but that’s what makes her so real and such a great role model. She’s relateable. Readers can picture themselves in her shoes. Elly gets herself into some interesting and embarrassing situations. But what I love so much about her, is that she pulls herself up every time. She doesn’t rely on others to solve her troubles for her, but she knows how to ask for an accept help when it is needed or offered. She’s real and realistically imperfect; you can’t help rooting for her and loving her. Perhaps something that I really like the most about Elly in Bloom and Elly in Love is all the flowers. If I could attempt a profession other than mine, it would be a florist. I love the bounty and beauty of flowers – their exotic scents and blooms, their wild hearts, the myriad emotions they evoke. Colleen Oakes brings that all to bold, bright, beautiful life. Want to win an autographed copy of Elly in Love? I just happen to have an autographed copy of Elly in Love and here is your chance to win! I shared about my desire to be a florist, now it’s your turn. Tell me: what job or profession other than your own would you like to try? Leave me a comment (be sure to include your email address!) on this post to enter to win! Winner will be selected at random on Friday, September 5, 2014 and will be notified via email. If I could have been anything other than a nurse, I would have been a nursery school teacher. I love small children. That’s why I stayed with pediatrics as a specialty! But I also am now off work and on disability. I miss working with my children tremendously. I want to be a project manager for software development. I don’t want to write the code. I want to help design and enhance the useability of business software. I would love to be a marine biologist! I love the ocean and all the interesting creatures. So much to explore!